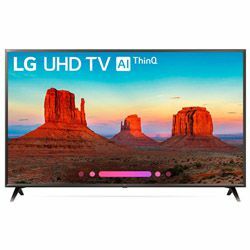 I need to compare the LG 55UK6300PUE vs TCL 55S405 to determine what is better: a well-known Korean brand device or less famous Chinese TV. The first unit belongs to the UK630 series and the second one to S405 series. TCL’s model was presented in the 2017 year. The whole product line has a Direct-lit LED technology and offers access to nearly 4000 streaming channels. The LG’s TV appeared on store shelves in the 2018 year. The whole series has AI and the IPS technology. 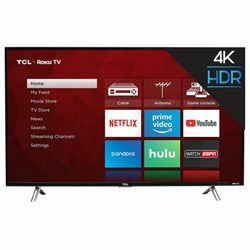 The TCL has very deep blacks. I can watch even the darkest scenes due to the great native contrast ratio and the wonderful black uniformity. The LG has a mediocre native contrast ratio. At the same time, the 55UK6300PUE has much better HDR peak brightness than the TCL. The picture on LG is more saturated, while the 55S405 proposes a little bit faded colors regardless of mode. The TCL 55S405 vs LG 55UK6300PUE settings comparison shows that the Korean device has a much adapted manual. Each step is supplemented by the detailed description and the installation performs easily. The TCL’s on-screen guide contains lots of meaningless text. Due to that the setting process is hard. The TCL works much quicker than LG. It has 2 cores, while the 55UK6300PUE has only 1. The sound is amazing on both devices, but the 55S405 has really lower sound versus the LG’s TV. The TCL can boast with a wide supporting stand that requires very large table but supports the TV well. The 55UK6300PUE has almost the same stand, but it prevents sound from spreading around the room. LG’s build quality is decent while the TCL borders creak after a light grip. The 55S405 has more presentable dark-grey panel because the LG has less universal and aesthetic detail (dark-grey but another shade). The apps updating allows Netflix or Amazon launching with the help of the remote controller. The TruMotion technology creates an amazing Soap Opera Effect. I can’t reach the LG Content Store via Wi-Fi network. I have to connect the TV to our cell phone and to visit the mentioned store. I can’t find a clear way to delete apps I don’t need. The ROKU system helps save 1 input and has an amazing interface. The Clear Motion technology improves the quality of the dynamic scenes displaying. Out of the box, settings are awful. In dark scenes, people are so red. The viewing angle is small. The objects become fuzzy as I move to the side.